Waou this topic has grown since the last time I checked it ! 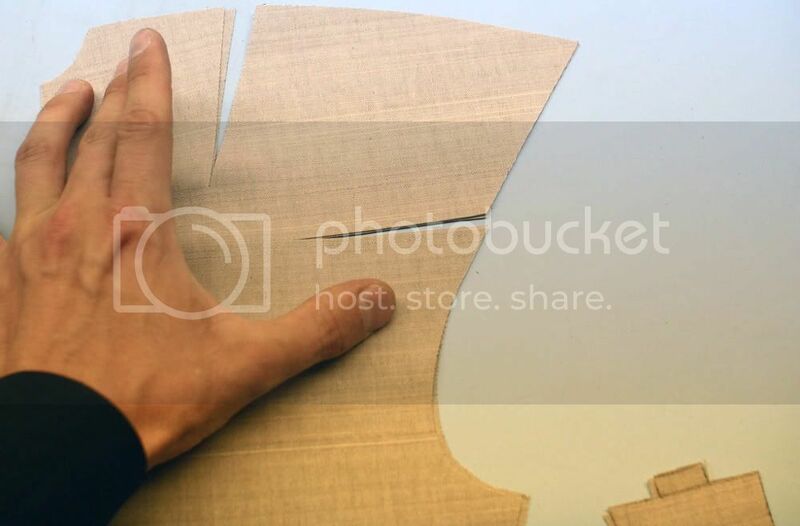 A propos the "cut on shoulder piece", here is a picture of how I learned to cut canvas here in Paris. There are several tailoring "schools" in Paris, I presume others here do things differently. 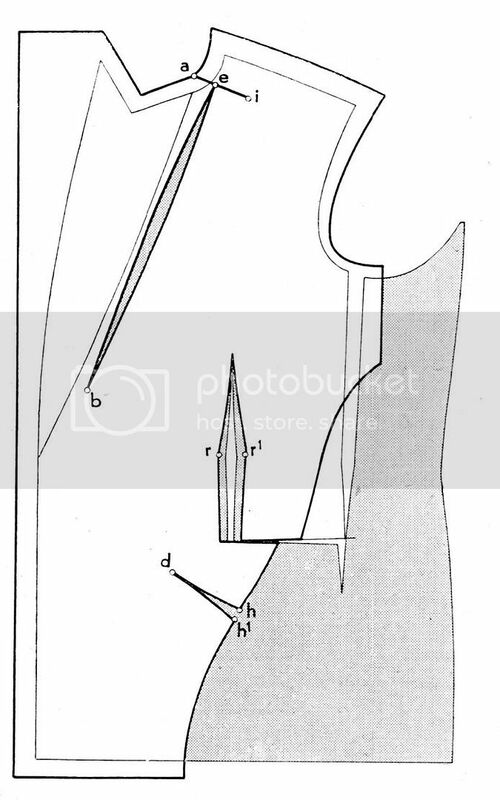 There is a clavicle dart quite similar to the cut on shoulder piece, but placed slightly differently from the german layout given by Sator. The other darts are quite usual, nothing to say about them. The canvas used here is a very light wool canvas, the kind used for neckties, as the cloth itself is quite light and the coat will be a summer lightly structured coat. The chest piece is cut along the same pattern. The grain is slightly on the bias : the right side of the canvas is nearly along the grain. Before learning this canvas layout, I used to make one or two vees in the shoulder. I found by myself how to make a pagoda shoulder, and the method I found is quite similar to the one published by Jeffery (I was really happy to find this kind of confirmation my idea was a good one). I still use it for concave shoulders, with 1 vee and 1 ou 2 cuts in the shoulder (depending on the canvas weight), plus a lot of iron work to distort the weft/warp angle. So things quite similar to what has already been published here, I guess. The following comes from ASZ 15th February, 1951, p46. 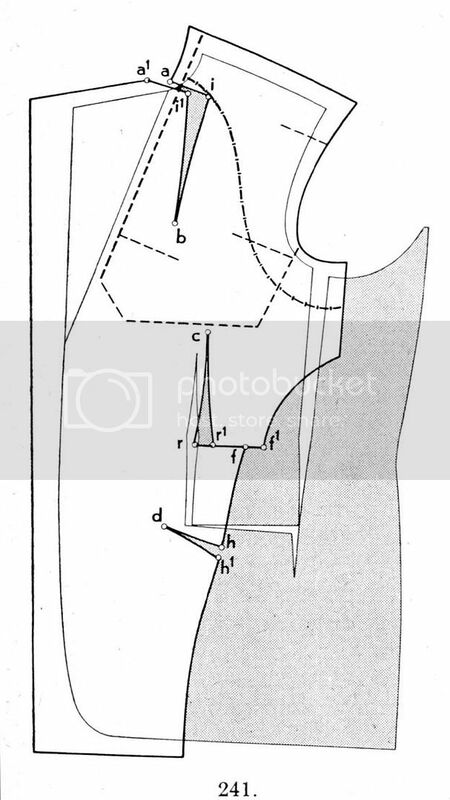 The text says that the idea behind cutting a horizontally placed chest dart along the lapel line is to introduce shortness along the lapel line of a reefer jacket. 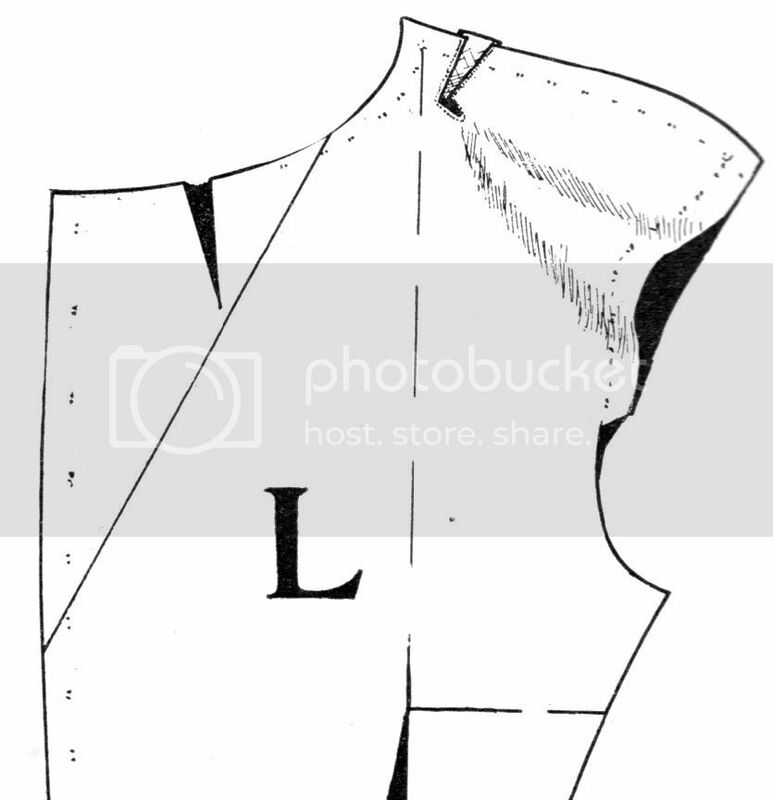 A gorge dart at the top of the coat creates insufficient amounts of shortness in the line of the bridle, and is less suitable for double breasted coats because of it tends to mitigate against the infusion of a rounded fullness to the lapels. The horizontal lapel dart works better to introduce such fullness of the lapels. The shortness along the bridle also helps to keep the overlap at the front of the DB coat tidy. The cut in the canvas introduces fullness in the lapels. It also functions in the same way as the gorge dart in making the chest fuller. It also gives length to the lapel edge. The cut is placed at the maximum fullness of the chest (about the height of the chest construction line). It is sew together using something like a strip of lining. The full draft can be found here. 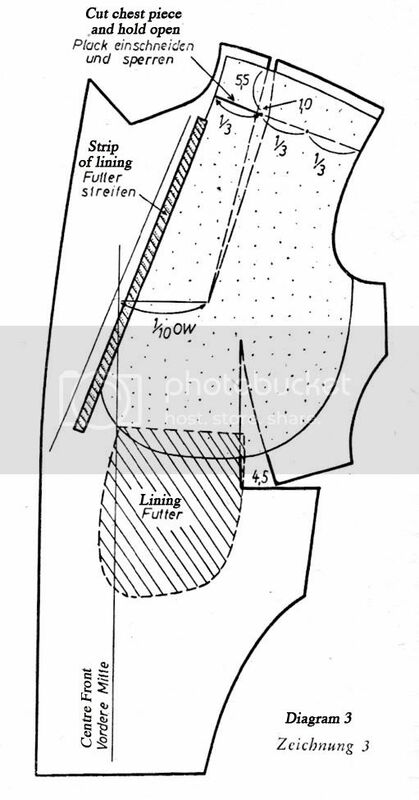 One thing I should comment on that is not discussed by the literature is the difference between a structured ("shaped") vs a unstructured ("soft") approach to cutting the chest canvas. The body canvas will be made of wool and hair of decent weight (but still suitable to the weight of cloth chosen). The canvas is cut on the straight. Note how the chest piece is extended so as to reach close to the waistline. 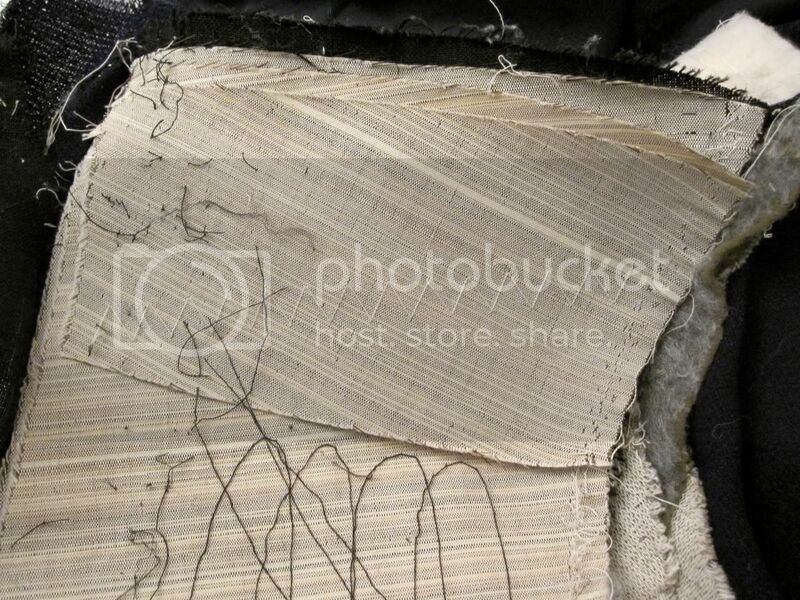 Note how close the pad stitching is. 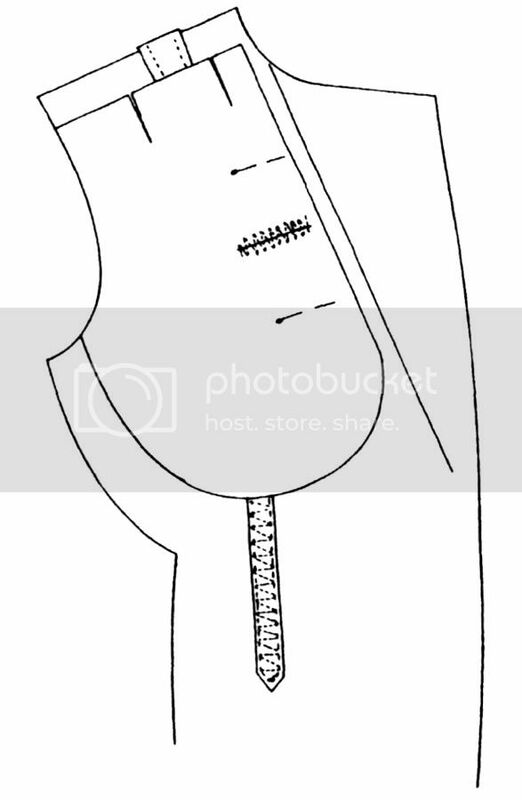 After horizontal rows of pad stitches are inserted below the shoulder, a second row of vertical pad stitches are inserted around the armscye area, and functions as an armscye reinforcement. 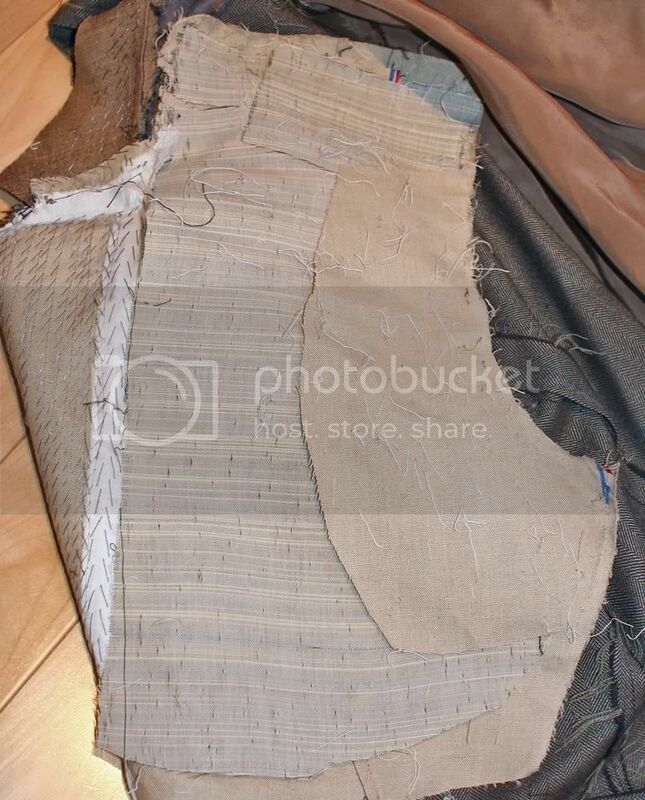 That means that there are three layers of chest canvas in the shoulder plus a layer of body canvas and domette. The additional shoulder reinforcement allows for the opportunity to open an additional wedge at the neck, thus giving the canvas more shape. 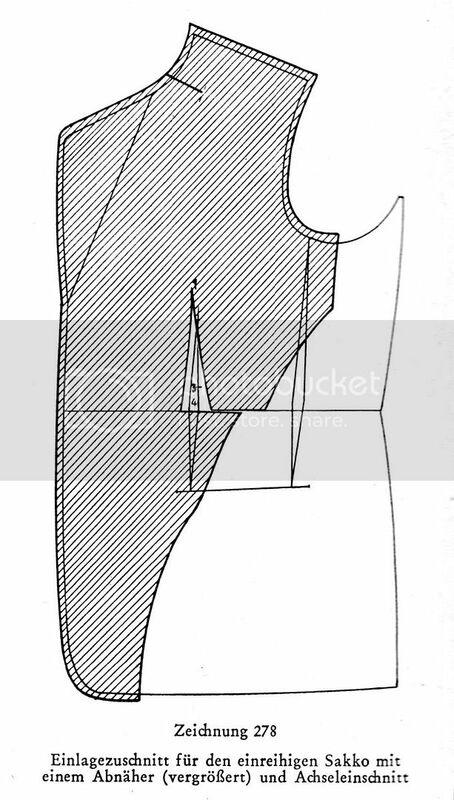 It is important to note that in the above example, the shoulder reinforcement is cut on the partial bias, rather than true bias, with the run of the horse hair in the woof pointing upwards towards the shoulder point, to help push the shoulder point upwards, creating a higher, concave shoulder. True bias in the shoulder, with the hair in the woof pointing in the opposite direction towards the neckpoint is generally more typical of a less structured low shoulder. This is cut from body canvas in this case, but I have seen examples cut from chest canvas. This helps to keep the front edge short and clean, throwing length to the armscye. 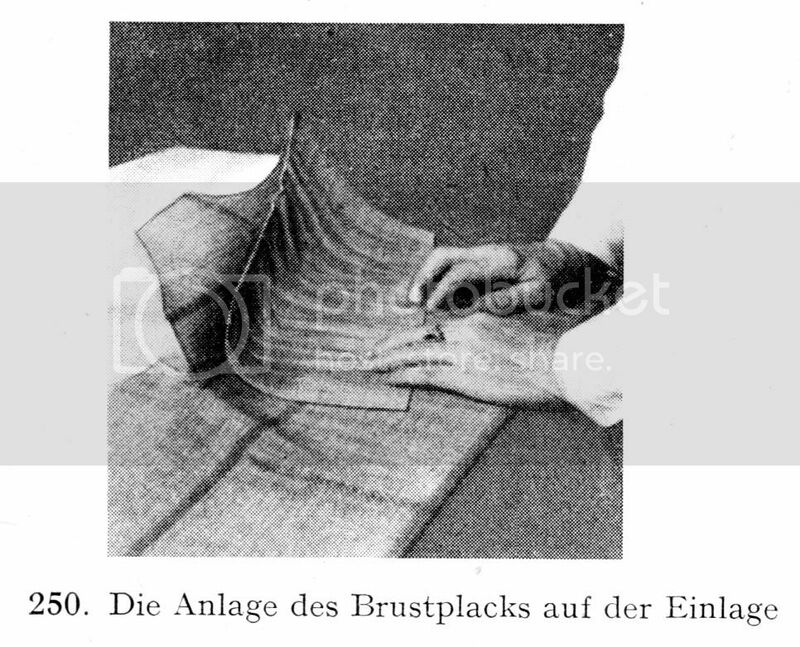 However, an additional bridle of straight tape, line or lining is also used. 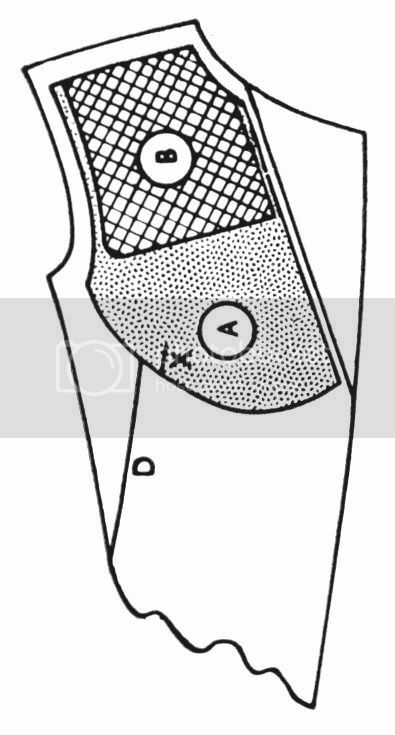 "it will allow shoulder shaping to be achieved without the insertion of puffs or the cutting out of slits". 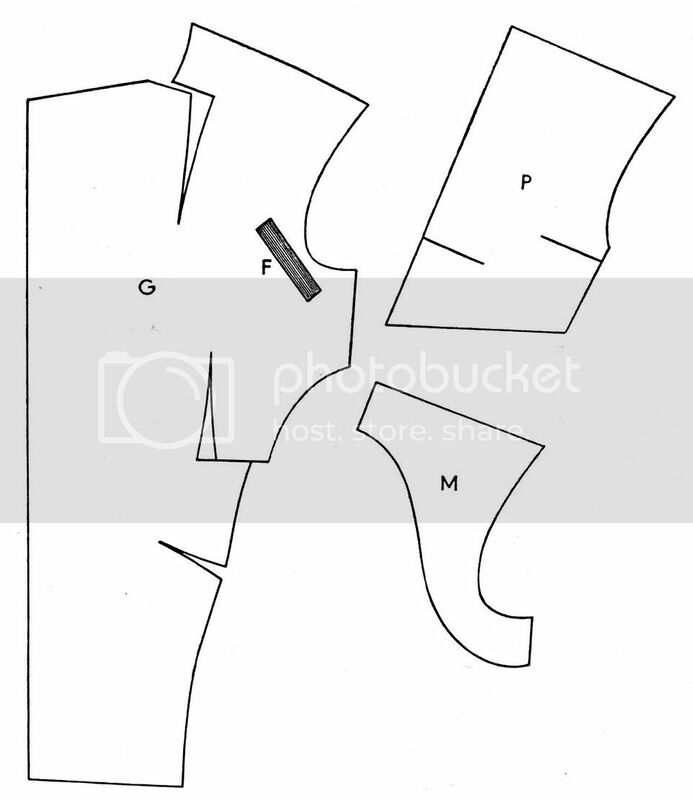 This consists of (A) felt and (B) chest canvas on the bias . Although Whife is silent on this issue, the horse hair in the woof likely points in the direction of the neckpoint, rather than at the shoulder point, as the latter will tend to push the shoulder point upwards in the manner of a structured concave shoulder, whereas an unstructured coat usually has a low shoulder. Note in particular, how extremely short the chest canvas is - it barely reaches below the level of the armscye. Note additionally the way it is cut away from the front of armscye, which mainly serves to create softness and ease at the front armscye. For some peculiar reason the hair cloth is cut on the straight, something that might be expected to interfere with the contouring of the canvas at the shoulder, thus necessitating additional shaping with extra cuts and layers. If the chest canvas were cut on the bias it might have further eliminated the need to cut away the canvas at the front of armscye. Note too the avoidance of any domette or heavy felt on the chest piece, as this adds to the weight and structure of the chest. Instead a lighter material is substituted. The number of cuts are kept to a minimum. 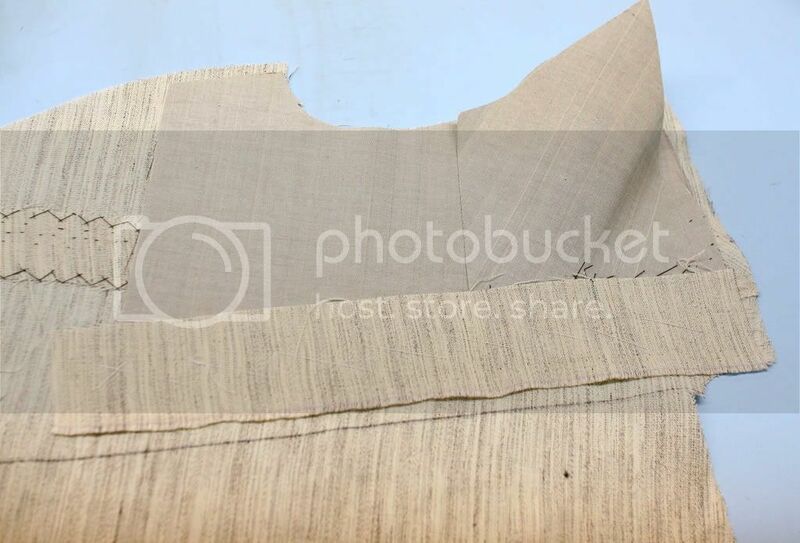 This is partly because the canvas is very light, and it will lose its spring and shape excessively by the addition of extra cuts, making many of the older canvas patterns in this thread unsuitable. It is also because the addition of extra layers of reinforcement to compensate for the cuts will add to the structure. 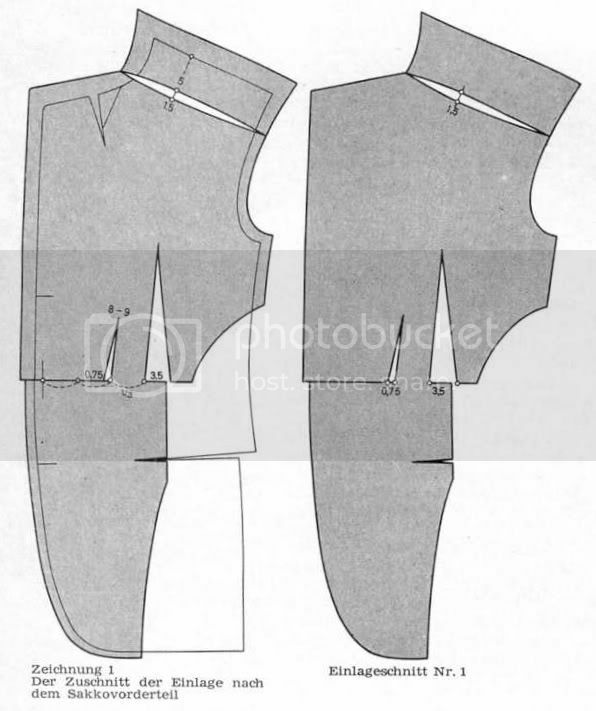 Lastly, lots of cuts means lots of shaping that produces the cleanly sculpture look of classical tailoring, and this is avoided in preference for a easier look. A shoulder reinforcement is usually absent. The canvas at the shoulder is already on the bias. 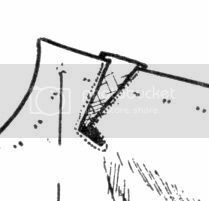 If a shoulder reinforcement is added, it should be a light linen canvas or perhaps even silesia - and always cut to sit on the true bias along the shoulder. 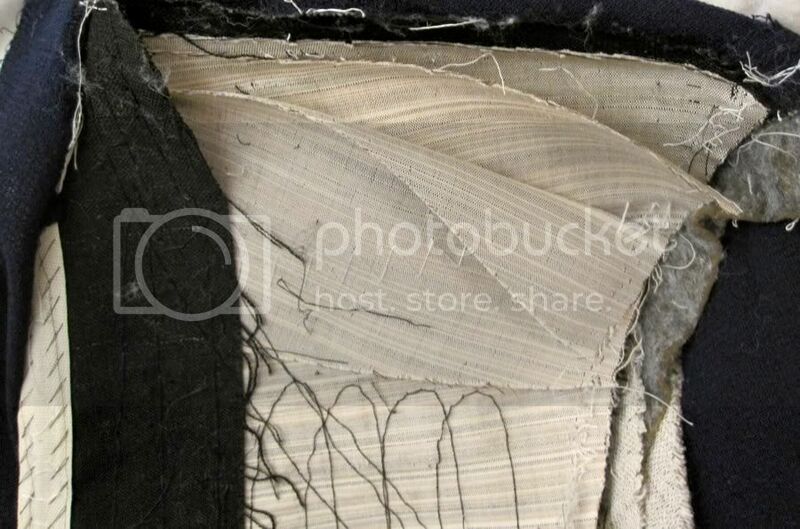 Lastly, the placement of a strip of canvas along the bridle is usually avoided. 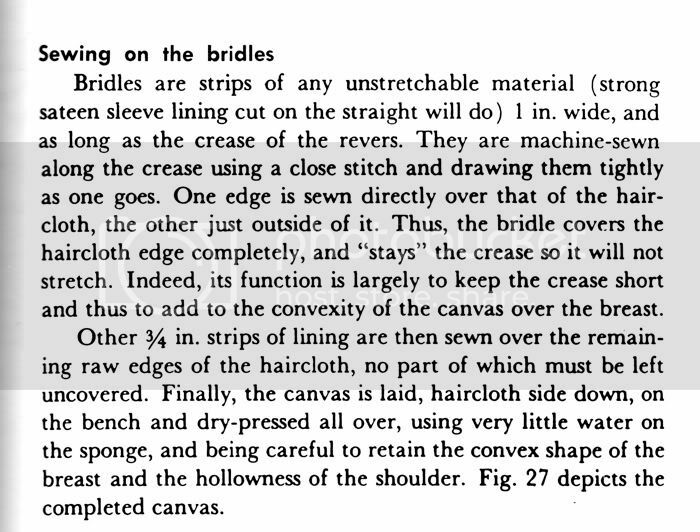 Instead, only a stripe of lining cut on the straight should be used for the bridle. Most real world canvas will show a mixture of the two approaches. 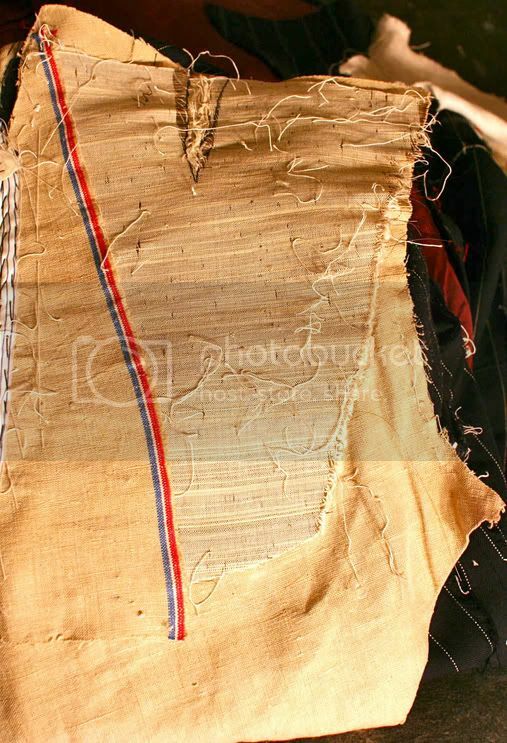 The end result is that the chest canvas sits slightly on the bias, which lightly softens the spring of the horsehair in the woof. This is also more economical and wastes less haircloth. Note the way there is a lot of rounding of the lower front edge, and it is so short that it hardly covers the front dart at all, but still longer than the true unstructured canvas from Whife. 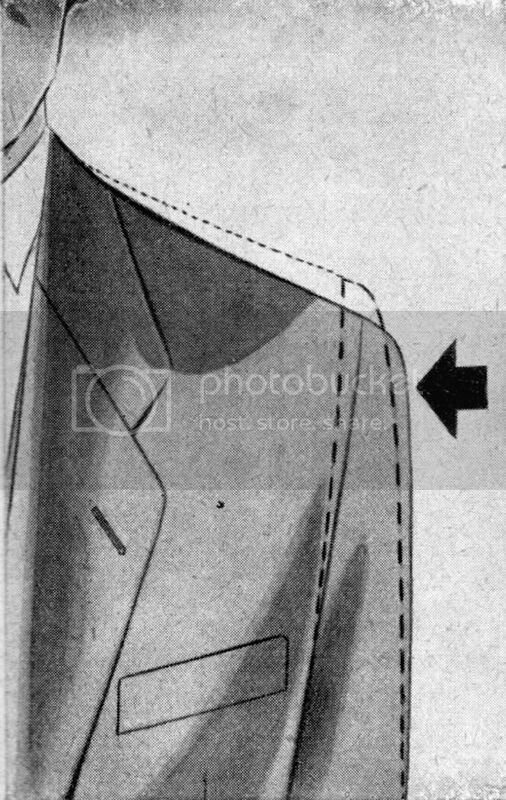 The idea is to create a softer roll at the bottom of the lapel. The density of the pad stitches is moderate. Note that the canvas is made of linen, yet the chest piece extends the length of the bridle. 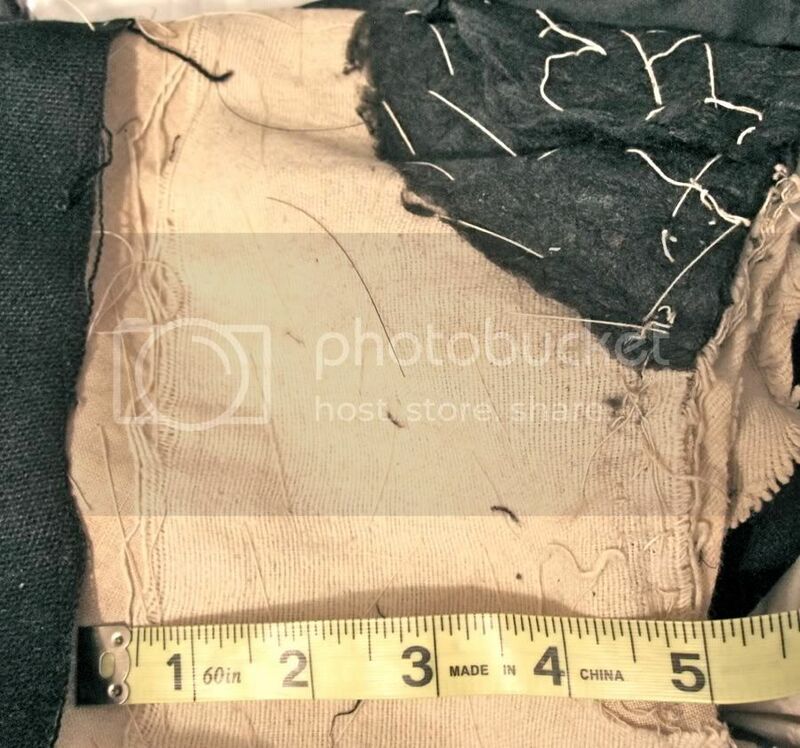 The shoulder reinforcement may be cut from wool-hair body canvas rather than chest canvas or linen canvas. Otherwise it may be made of softer material such as linen canvas, or light body canvas. 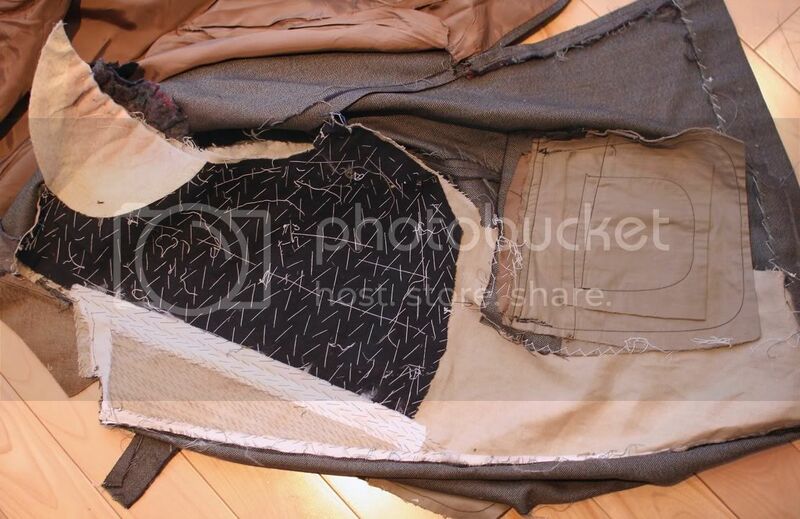 Note, however, the presence of armscye reinforcement - of linen rather than of chest or body canvas. Unfortunately, there is no English language version, but you can still learn a lot from their diagrams. I just couldn't help but discuss their method of making up the canvas here, and I hope you find it interesting. The roll line is marked with chalk (which as you know is very important to do). 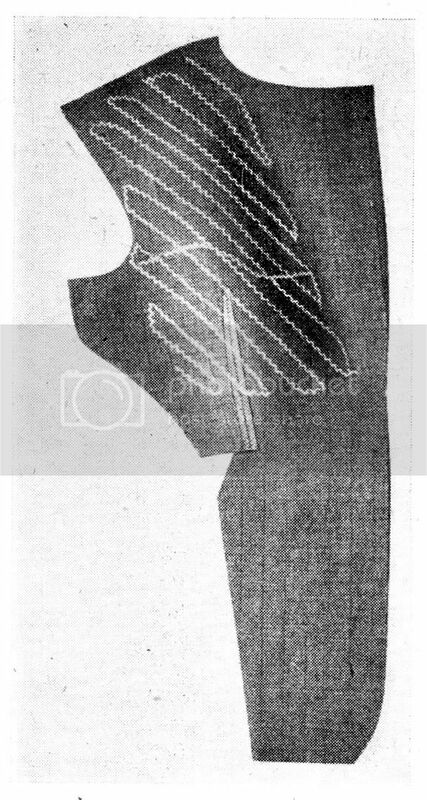 Note that there is a slight curvature of the shoulder wedge (0.3 mm only), as shown in the enlarged inset. 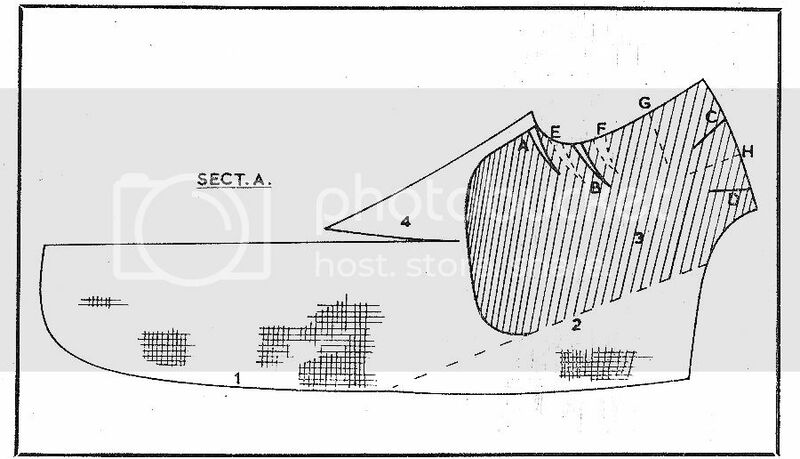 The point of the wedge is point P. Notice too the small 0.5 mm extension of the tip of the shoulder wedge beyond P.
The 5-6cm long shoulder wedge is to be held opened up so as to be 1.5 cm wide on the nett pattern. 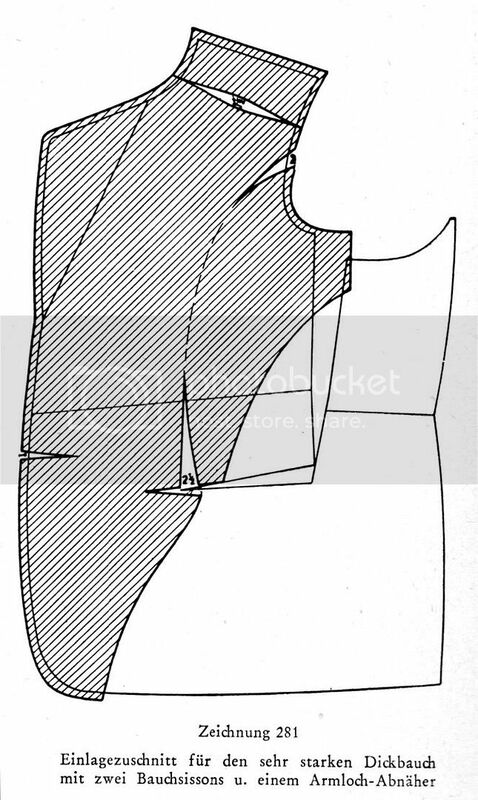 The shoulder dart is held open with a wedge cut on the bias. The bias cut wedge is interestingly sewn on with an ordinary machine lock-stitch rather than with a zig zag stitch. The front dart is closed with a strip of bias tape using a zig zag stitch. At 3 two rows of machine stitching is placed here. 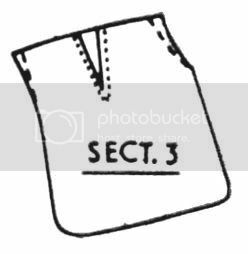 Sew with a machine stitch 0.5 cm from the edge around the canvas where shown (number 4). 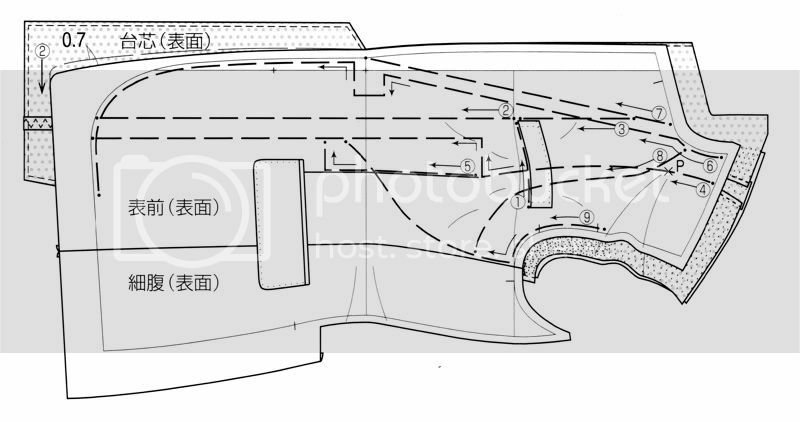 There are three 0.5 cm wide and 4.5 cm long vees cut out along the front edge. The front edge is 1 cm in from the roll line at the top and bottom, but only 0.5 cm in the middle. The length of the front edge extends 3 cm below the waistline. 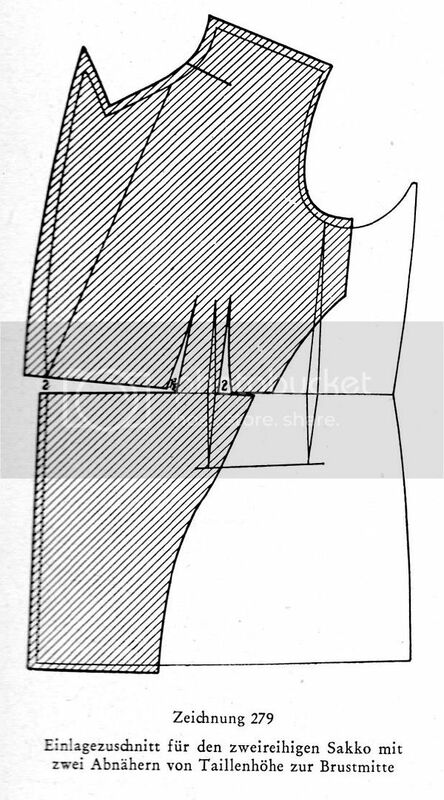 The enlarged inset shows how the points of the shoulder wedge of the body canvas and armscye wedge on the chest canvas much overlap. 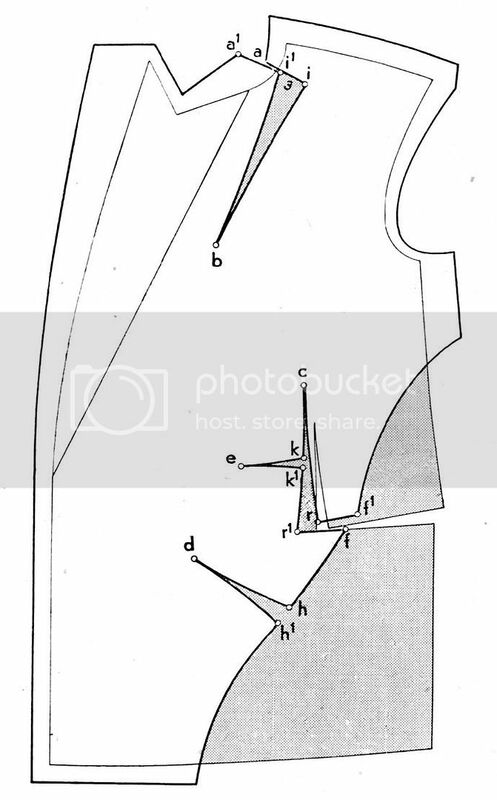 That is, they are like darts rotated around the same centre, indicated by the letter P. A piece of body canvas is used to hold open the armscye wedge, so that it is 0.5 cm larger than the wedge at the shoulder. 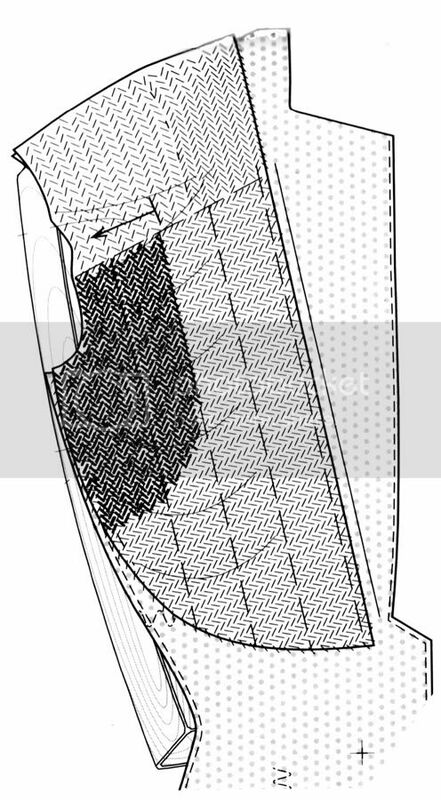 The armscye wedge is sewn on using bias tape with a zig zag stitch. Likewise the other darts. The front edge is then shrunk in to shorten it, and then stitched with a machine stitch 0.5 cm in from the edge. 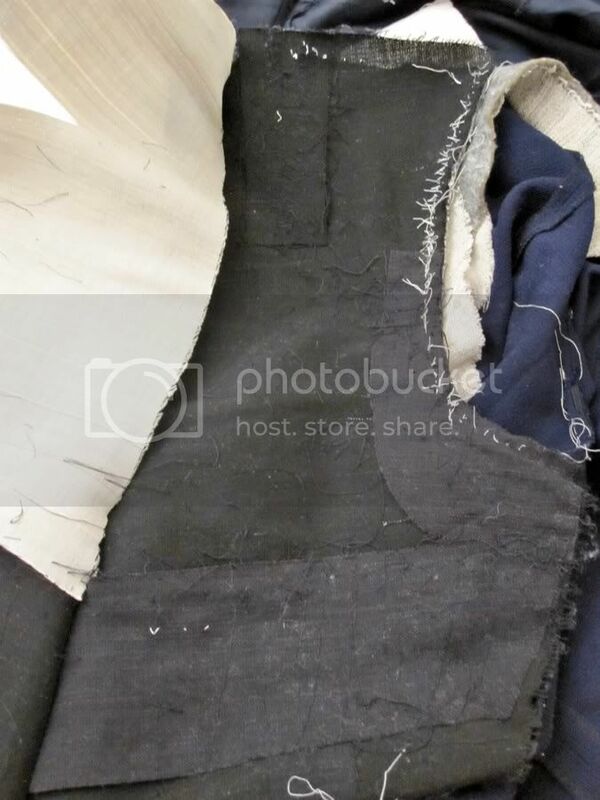 The machine stitch is extended around the edge as shown. 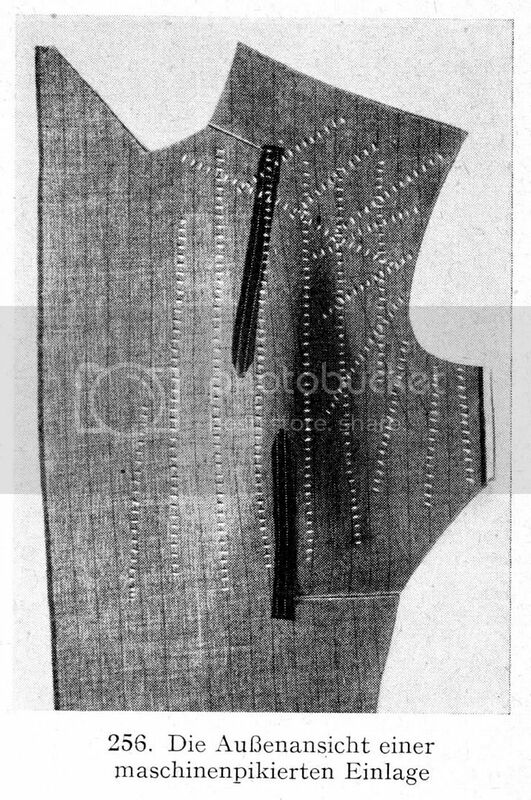 Two rows of stitches are inserted at the armscye as shown. The dart here should also point to the same centre, P as the other two darts. The following shows how the domette is shaped with the iron in preparation for pad stitching over the chest piece. They seem to baste the domette along the front edge, then trim it close to the front edge leaving only about 2 mm of excess there. Tweezers are used to smooth out the bottom edge of the domette so it doesn't show on the inside. The chest piece is then basted to the body canvas. The canvas is basted in so as to shorten the roll line by 0.5 cm. Note the rows of basting stitching on the wrong side of the canvas. The vertical rows are 4 cm apart. 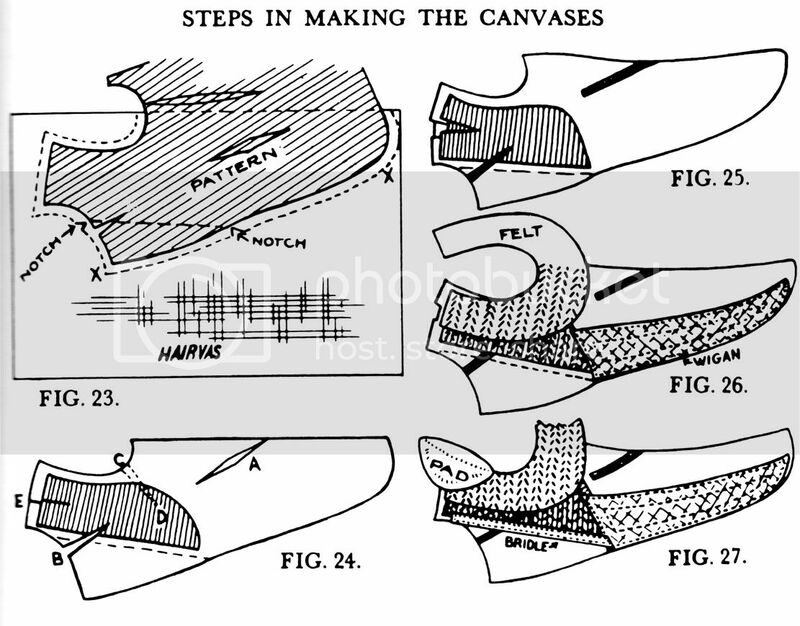 On the bottom right diagram, the chest canvas is basted from the right side at 4 and 5. 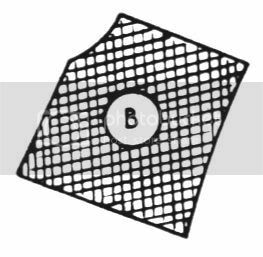 Note that the chest piece is placed only 1 cm behind the roll line - most authors recommend placing it at least 1.5 cm behind the roll line. The most striking feature is the sheer density of the pad stitches (which are frightfully time consuming to sew). 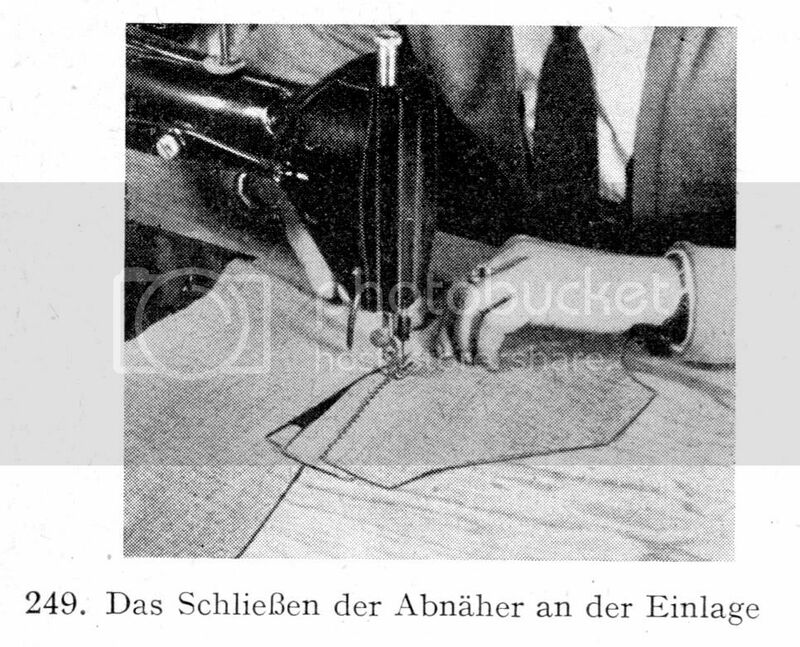 Some old Schneidermeister texts from the 1930s mention how such closely placed pad stitches were used in the old days before soft tailoring started to be favoured, but this is the first time I have seen anything like this in a modern text (this book dates from 2010). At the top left, the pad stitching commences in the direction indicated by the arrow. 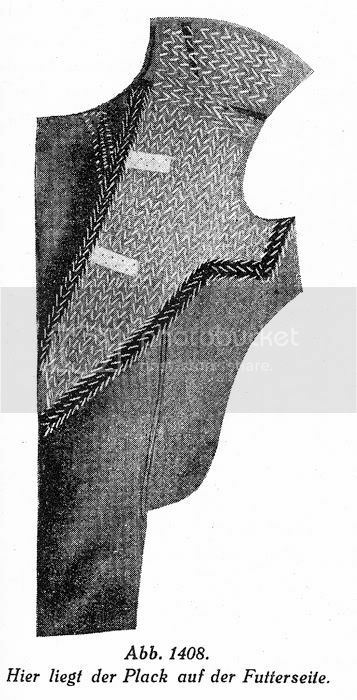 Note how the stitches follow the outline of the shoulder wedge. At top right, the pad stitching continues progressing in the direction indicated by the arrow. Below the horizontal line of the basting stitch, the pad stitches run horizontally. Finally, at bottom right, a second row of pad stitches are inserted around the arm scye but this time running in the opposite direction. Finally a bridle consisting of a strip of straight tape is sewn on - surprisingly using a machine stitch without instructions to draw it in. 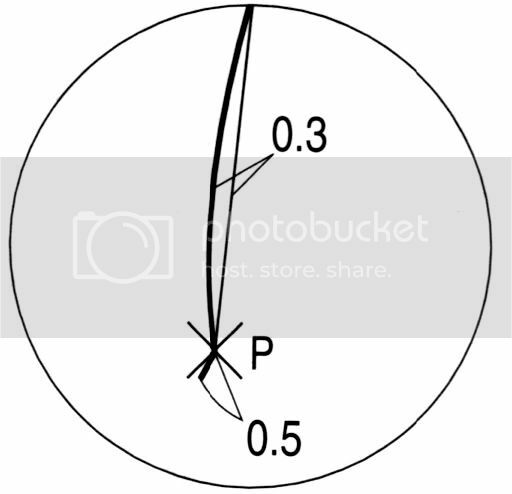 Note that it is a two part dart, with a 0.5 cm extension going in the opposite direction to the curvature of the main dart beyond point P.
Adding a curve to the dart makes it effectively larger. Willi Leibold on canvas construction - Das Schneiderhandwerk (The Tailor's Handwork), 1958. 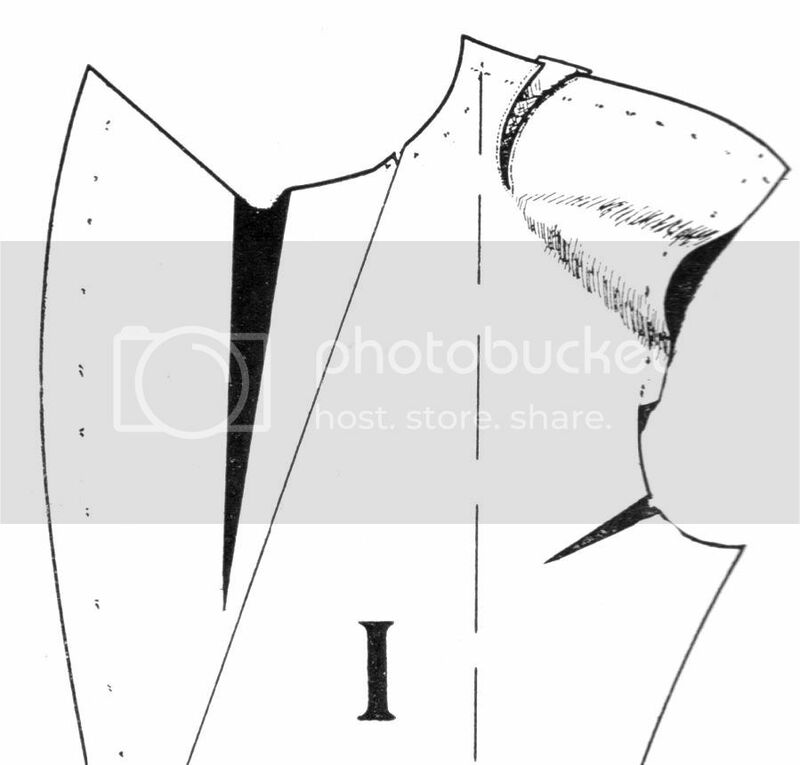 The chest piece is kept short and the front edge is blunted to allow a soft roll of the lapels. He explains that the longer chest piece is considered heavy and old fashioned. Note how none of the front dart is covered by the chest piece. I made the decision to design a canvas. I decided to avoid seams in the area of the neck, chest and clavicular union darts. Willi Leibold on making up canvasses. 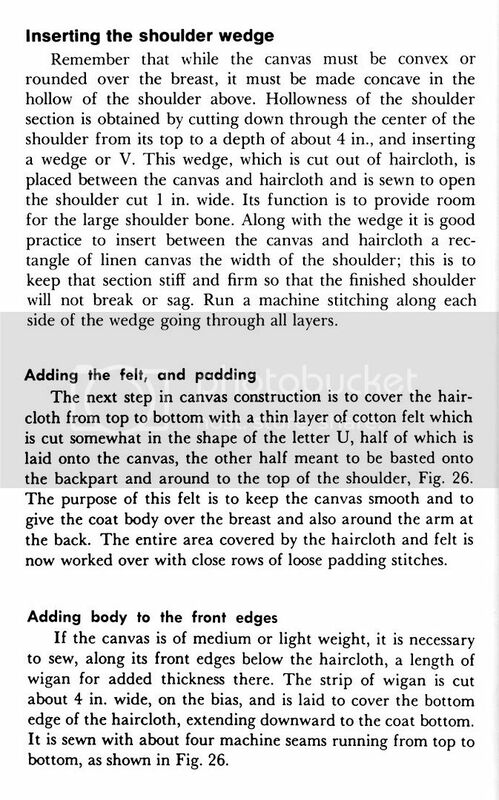 Next, I thought I would share the full text of Clarence Poulin's discussion on canvas making from his book Tailoring Suits, Third Edition, 1973. The method here is rather old school American. The text has not changed at all from his 1950s second edition book. 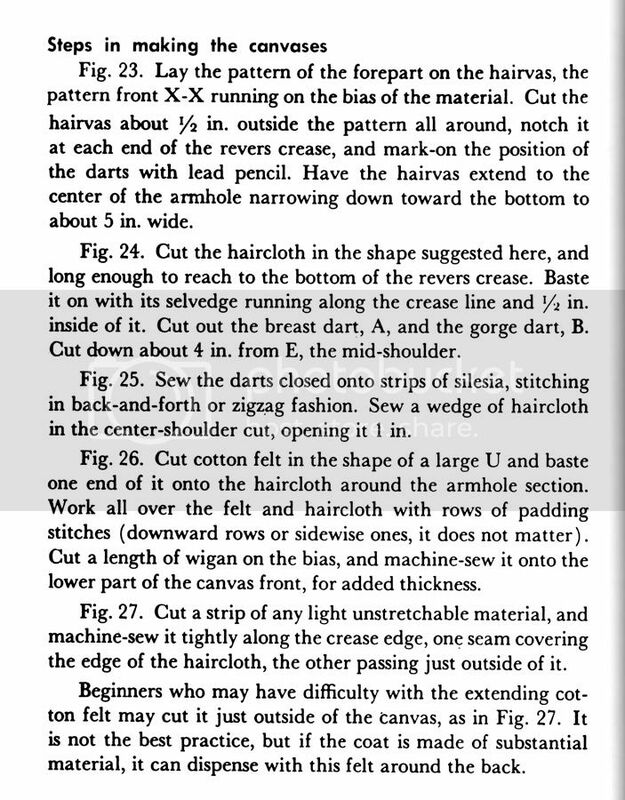 In those days, I am told that wool-hair body canvas (which American tailors traditionally call "Hymo", just as Australian tailors call it "Optima") was very heavy, and it is likely that the reason for cutting it on the bias was to give it more softness and pliability. It is questionable whether this is necessary on modern wool-hair body canvas. 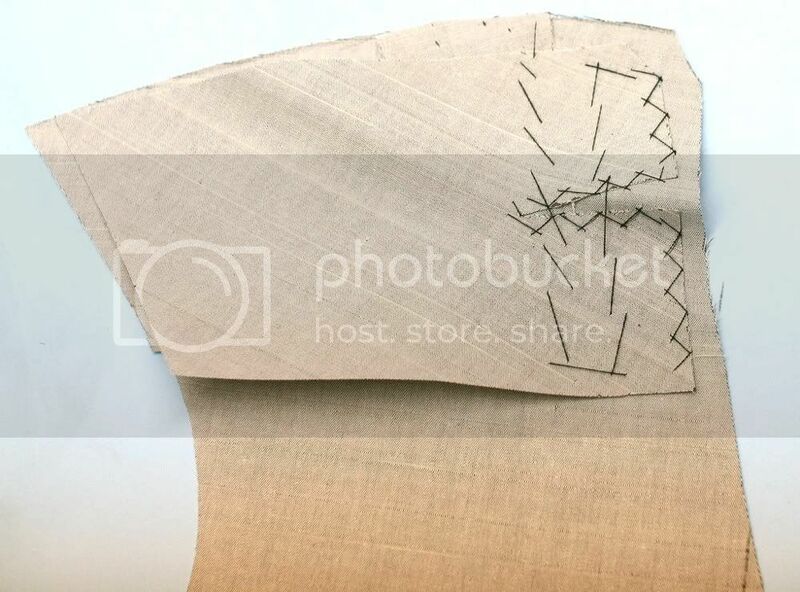 Of interest to is that way he adds a layer of bias-cut linen canvas ("wigan") to the front of the canvas making it unnecessary to stay the button holes. The way the domette is extended around the the armscye ("wing") is also old school, and uncommonly seen today. There are a number of situations in which bias at the shoulder can be used to advantage. The idea here is that bias at the shoulder might be used as a short cut and substitute to time consuming working up of shape and structure in the shoulder. That is, there must be true bias at the shoulder if time consuming shoulder shaping is to be avoided. In this case, the entire shoulder section of all layers of canvas end up on the bias, and this can certainly help the chest to drape. 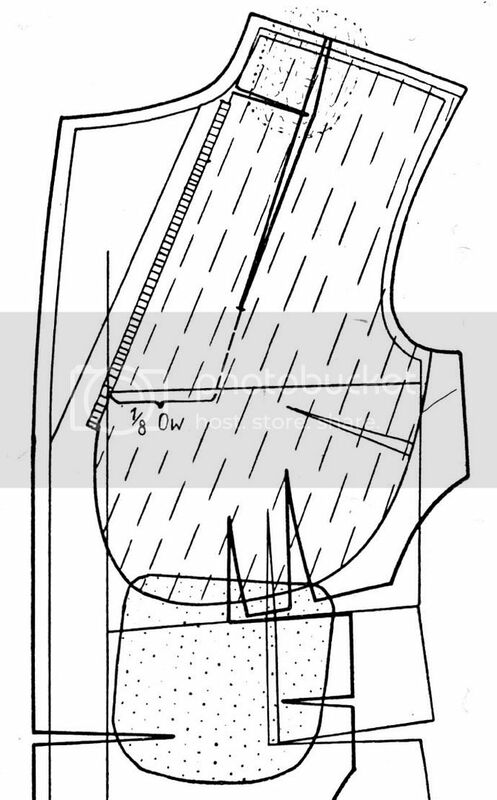 However, only the cut on shoulder piece allows control over the bias at the shoulder. 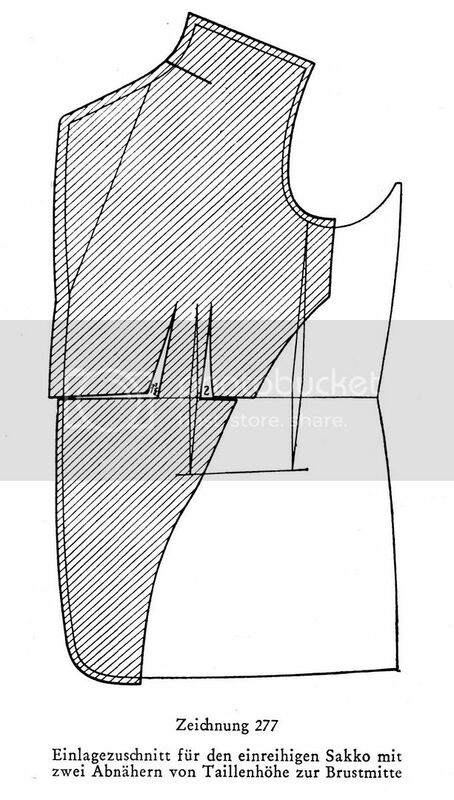 While the neck seam gusset does throw more length to the front, by elongating the neckpoint upwards, this is likely to be less of a problem with a drape cut where the neckpoint is already quite straight, creating shortness through the front balance. 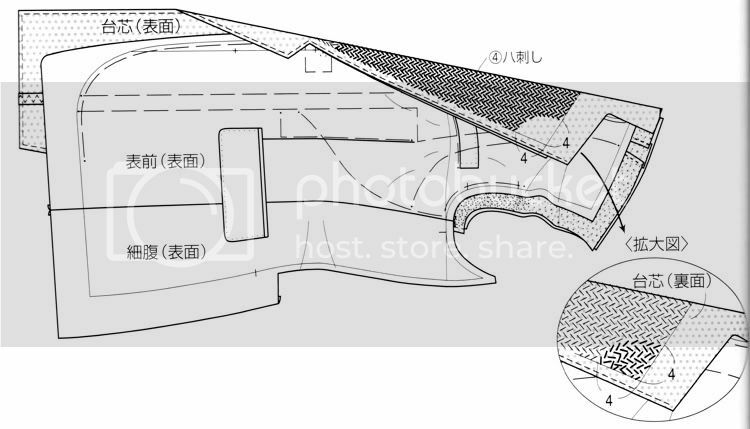 I think the whole idea of the cut on shoulder piece is to create a more plastic, and less worked style of coat that nonetheless retains some measure of shape, while reducing labour costs and time. Note the orientation on the partial bias. The horse hairs in the woof are pointing towards the shoulder point, which helps to point the shoulder ends upwards to create a concave shoulder. When the hair in the woof is pointed like this in the opposite direction, this would encourage the shoulders to collapse downwards, resulting in a low shoulder. 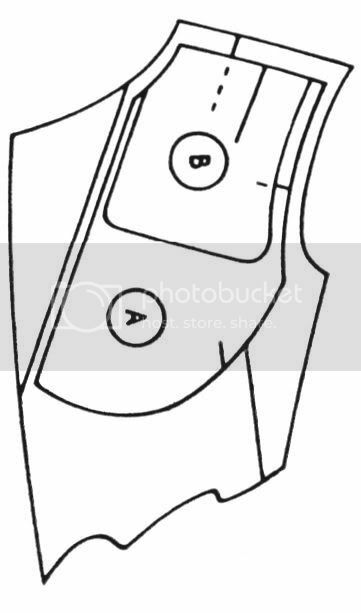 You could call this a convex shoulder. More canvas patterns - this time from Zuschnitt XIII (1950s). Just as cloth was generally heavier, so too was the canvas of the period heavier. That meant that you could put extra cuts in it without fear of excessively weakening the canvas. Due to progress in weaving technology, both cloth and canvas can now be made very light. There is a risk of making the canvas too weak when some of these old canvas patterns are used today. However, apart from Nr 277, the patterns 276 and 278 would be suitable to use with modern canvas. 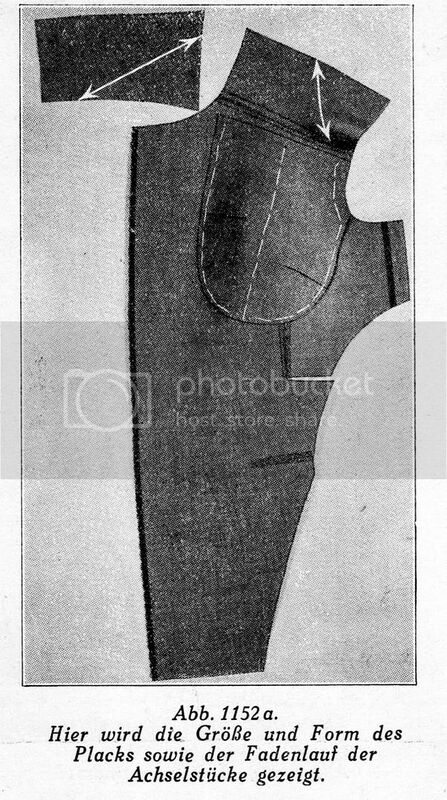 Firstly, a canvas with two darts at the armscye and a cut to be gusseted open at the neck. The length of the curved armscye darts is 6-7 cm. 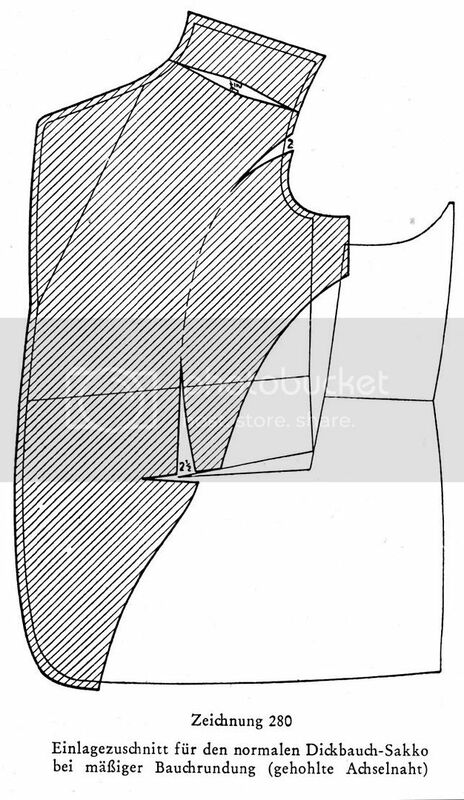 The front dart ends about 8-9 cm below the level of the armscye. The two darts create a pronounced chest effect. 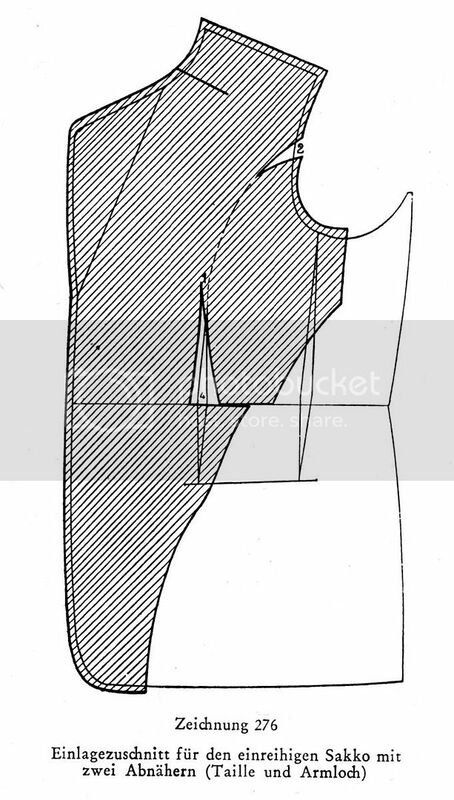 Note that a gusset is opened at the neck rather than at the shoulder. This has a similar effect, but throws the neckpoint more crooked and elongates the front balance. Here are three more canvasses from Zuschnitt XIII. Again there is a second front dart. Note too the orientation of the grain on these Zuschnitt XIII canvasses - on the bias. 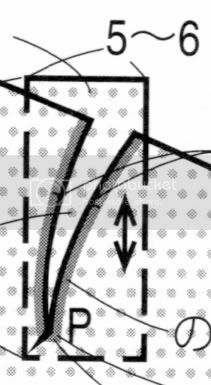 The orientation of the grain on the cut-on shoulder section has been adjusted to ensure there is bias relative to the shoulder. 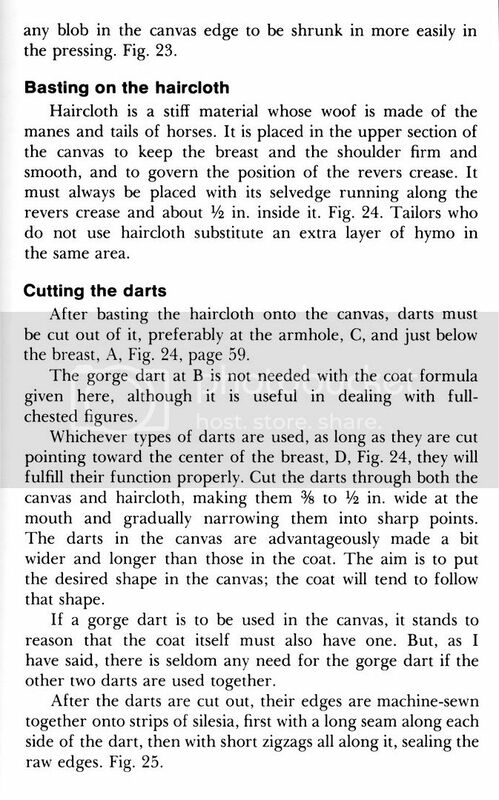 They emphasise the need to close the darts with either a cross stitch or a machine zig zag stitch. 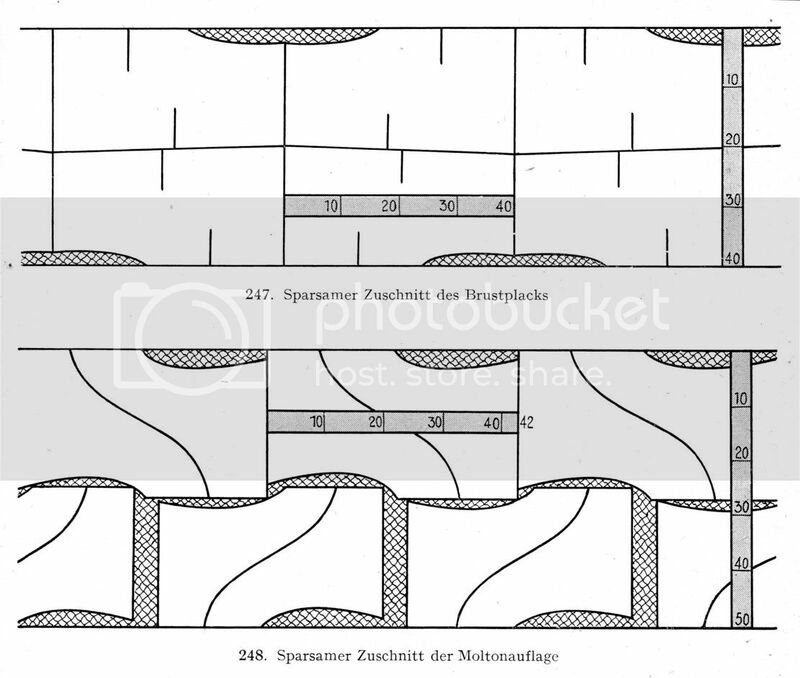 Also from Zuschnitt XIII - some overcoat canvas patterns. The bias stripes/ lines are called "Schraffur" in German and usually just indicate a different section or part in a diagram, in this case they mark the canvas part. 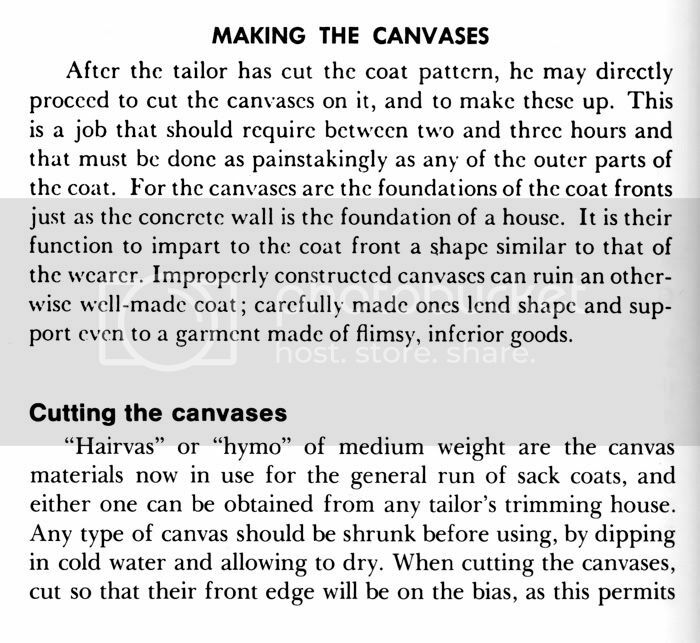 I have never seen any German publication suggesting to cut canvas on the bias. 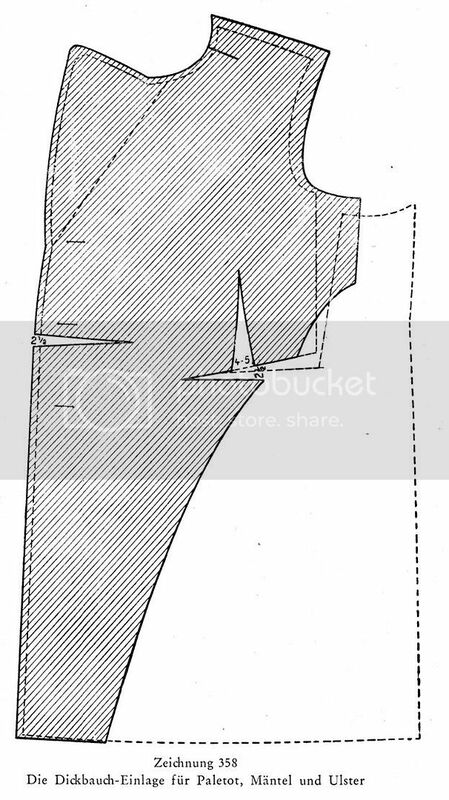 German tailors were very particular when it came to saving money and material.